Bahia Prinicipe resorts have gained great prestige among frequent all inclusive resorts’ guests and Bahia Principe San Juan is not an exception because you can find there everything you might think of for your eagerly awaited Caribbean vacation. Bahia Principe San Juan is an independent village like resort, with its shopping centre, casino, internet cafe, restaurants, bars -even an art gallery! As any other big resort, Bahia Principe San Juan offers its guests a wide variety of top class facilities, activities and amenities. You can relax by the pool; enjoy the beautiful mangroves and tropical gardens around de hotel, stimulate your senses on the beach or try surfing at Bahia Principe San Juan. Just give free reign to your imagination, at Bahia Principe San Juan you will find everything you would like for your lifetime vacation. Bahia Principe San Juan is located on the North Coast of the Dominican Republic, Just 60 minutes away from the Puerto Plata International airport, and not so far from Cabarete, Sosúa and Puerto Plata. Bahia Principe San Juan is located on a stretch of 1.5 kilometres of a beautiful white sandy beach and it is a short drive from Playa Grande, a famous beach in the area. The resort was opened in July 1995. This large resort covers an area of over one and a half million square metres. It is set on a stretch of 1.5 km of a private beach framed by a coral reef and it is surrounded by lush tropical vegetation with mangrove swamps. Little lanes go through its tropical gardens to allow guests walk, enjoy the breeze from the Ocean and the beautiful tropical gardens. 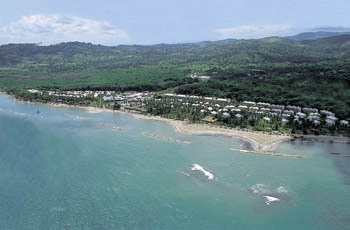 When you get to Puerto Plata airport, take the motorway to the left, go through Sosúa and Cabarete and on to Gaspar Hernández. If you arrive to Santo Domingo airport, take the Duarte-San Francisco Marcoris. More than 900 Rooms and none of them is more than 150 meters from the beach. The rooms are spread through out the resort in Villas and are all perfectly appointed. Rooms in the Golden Club give you access to extra services and amenities and they are available for a supplement. 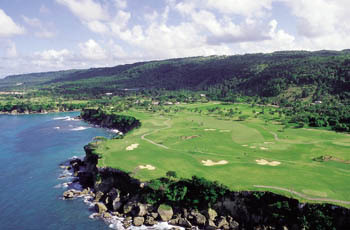 Bahia Principe San Juan facilities invite guests to enjoy a wide variety of activities. Two lake-type swimming pools that include a kids’ section and a Jacuzzi are the focus of attention at the centre of the resort. Spend some time by the pool, lounge in a chair and relax under one of the many sun shades available. 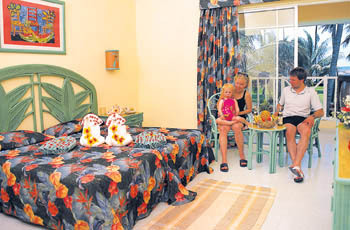 Bahia Principe San Juan aims to provide the perfect atmosphere for the families visiting the resort. At the Mini-club your children will be taken care of by a professional and friendly staff. You can enjoy lots of shows and great activities throughout the night and day. Water sports, tennis courts and a full service gymnasium are also available. You will never get bored because Bahia Principe San Juan staff takes pleasure in satisfying its customers’ needs. You will always find something that suits your preferences. 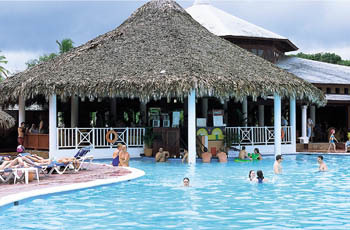 But that’s not all, at Bahia Principe San Juan you can also take dance lessons and enjoy theme evenings. Apart from the children's section of main pool, Bahia Principe San Juan offers a playground, a full activity programme, and a mini-club (ages 4-12) where they can enjoy lots of fun activities and a mini disco. The Mini-club’s fully qualified staff offers children lots of recreational and interactive activities to guarantee they have fun in a healthy and safe atmosphere. Your child will love the DONALD DISCO, a show created especially for kids. They will dance, participate in contests and much more. Guests can enjoy unlimited local drinks, beer and soft drinks in all bars until 23:00 pm.at the Disco, "La Terraza" Bar, "Karaoke" Bar and at "Rock Café" of Pueblo Príncipe. At the snack bar of PUEBLO PRÍNCIPE the resort’s guests can enjoy 24-hour service (only soft drinks). Bahia Principe San Juan Weddings is home to the Gri-Gri Lagoon, a well preserved tropical vegetation area covered in mangroves, which bears a wide variety of wildlife and birds. 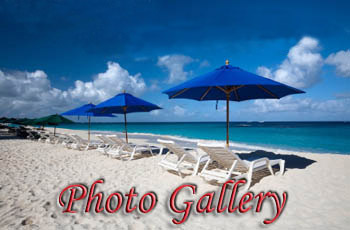 It makes the scenery for weddings at Bahia Principe San Juan spectacular. When you pick Bahia Principe San Juan Weddings for your destination weddings all-inclusive-weddings.com takes care of every detail. Consult our wedding packages, but if you want a custom-made wedding, just let us know what you want and all-inclusive-weddings.com will make your dream about your wedding in Puerto Plata com true. Consult our planner for more information.